The trend for a set of line features is measured by calculating the average angle of the lines. The statistic used to calculate the trend is known as the directional mean. While the statistic itself is termed the directional mean, it is used to measure either direction or orientation. Many linear features point in a direction—they have a beginning point and an end point. Such lines often represent the paths of objects that move, such as hurricanes. Other linear features, such as fault lines, have no start or end point. These features are said to have an orientation but no direction. For example, a fault line might have a northwest–southeast orientation. The Linear Directional Mean tool lets you calculate the mean direction or the mean orientation for a set of lines. In a GIS, every line is assigned a start and end point and has a direction. The direction is set when the line feature is created by digitizing or by importing a list of coordinates. You can see the direction of each line by displaying it with an arrowhead symbol. If you're calculating the mean direction, ensure that the directions of the lines are correct. If you're calculating the mean orientation, the direction of the lines is ignored. The mean direction is calculated for features that move from a starting point to an end point, such as storms, while mean orientation is calculated for stationary features, such as fault lines. There may be situations where you'll want to calculate the mean orientation of lines that represent movement. A wildlife biologist interested in where elk start and end their seasonal migration would calculate the mean direction of the paths the elk take during each season. However, the biologist would calculate the mean orientation if he or she were interested in the characteristics of the migration routes themselves to determine what makes a good route, rather than where the elk start and end. The biologist could calculate the mean orientation using the elk paths in both directions (coming and going) and capture more information about their movement. It is important to remember that while most lines have many vertices between the starting point and the ending point, this tool uses only the start point and the end point to determine direction. The Linear Directional Mean tool creates a new output feature class containing a line feature centered on the mean center for all input vector centroids, with length equal to the mean length of all input vectors and with either the mean orientation or the mean direction of all input vectors. Attribute values for the new line features include Compass Angle (clockwise from due North), Directional Mean (counterclockwise from due east), Circular Variance (an indication of how much directions/orientations deviate from the directional mean), Mean Center X and Y Coordinates, and Mean Length. Comparing two or more sets of lines—For example, a wildlife biologist studying the movement of elk and moose in a stream valley could calculate the directional trend of migration routes for the two species. Comparing features for different time periods—For example, an ornithologist could calculate the trend for falcon migration month by month. The directional mean summarizes the flight paths of several individuals and smooths out daily movements. That makes it easy to see during which month the birds travel farthest and when the migration ends. Evaluating felled trees in a forest to understand wind patterns and direction. Analyzing glacial striations, which are indicative of glacial movement. Identifying the general direction of auto thefts and stolen vehicle recoveries. Cordeiro, Gauss M., and Silvia L. De Paula Ferrari. 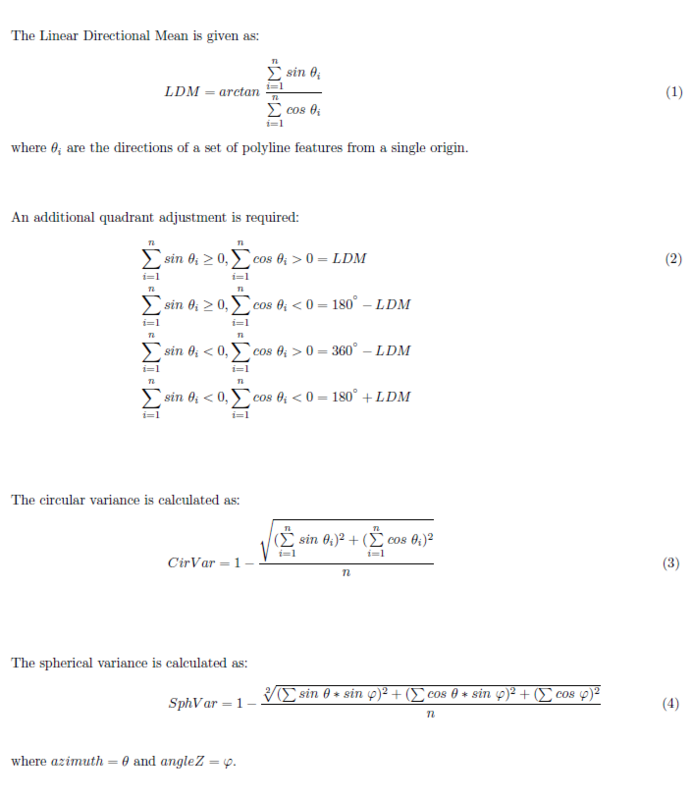 "A modified score test statistic having chi-squared distribution to order n −1 ." Biometrika (1991) 78 (3): 573-582. Mardia, K.V., and Peter E. Jupp. Directional Statistics. Chichester: J. Wiley, 2000.